The CCCC Motorcycle Mechanics program is the only one in North Carolina that is factory supported. Major manufacturers support the program through the donation of equipment and instructional materials. CCCC was the first college in North Carolina to offer the motorcycle curriculum. The program was developed with the assistance of industry leaders. Graduates are now industry leaders as successful owners of dealerships and repair shops. Motorcycle mechanics is the focus of our instructional program. Students enjoy many hours in our modern, well-equipped shop learning by doing. From instructional materials they take basic knowledge and develop skills for successful careers in the motorcycle industry. 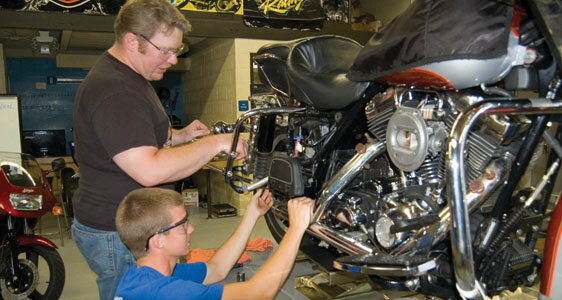 Students are prepared to inspect, diagnose, repair and adjust motorcycles, and ATV's. Instruction goes beyond a basic understanding of the operating principles, with numerous shop assignments and practices along with demonstrations. When students first visit the CCCC motorcycle facilities, they are amazed by the variety of tools, the order and cleanliness of the shop space, and the large number of motorcycles, and ATV's utilized in the instructional program. A diploma program is available during the day and a certificate program is available in the evening. Almost every graduate of the Motorcycle Mechanic program has a job lined up within a week of graduation. The demand for skilled motorcycle mechanics is high locally and throughout the nation. Students go to work as motorcycle mechanics or technicians, service managers, assemblers, parts persons and parts managers. Graduates find jobs at motorcycle dealerships, repair shops, salvage yards, marine dealerships, and motorcycle factories. Some start their own businesses. The CCCC Motorcycle Mechanics program is known throughout the state and region. Over the years it has built an excellent reputation. As a result, faculty members are able to assist graduates in finding jobs and to help open doors for students. Starting salaries vary depending on the location and type of business, but entry-level positions average around $10 per hour. With experience, graduates can rapidly increase their salaries to $35,000 per year. Most importantly, our graduates love what they do. Whether they are mechanics, managers, or owners, they love motorcycles, the sport, and the industry.